Close-up of a microflow system with red dye in fluid channel. The National Institute of Standards and Technology (NIST) has filed a provisional patent application for a microflow measurement system, about the size of a nickel, that can track the movement of extremely tiny amounts of liquids—as small as nanoliters (nL, billionth of a liter) per minute. If water were flowing at that rate from a 1-liter bottle of water, it would take about 200 years to drain. 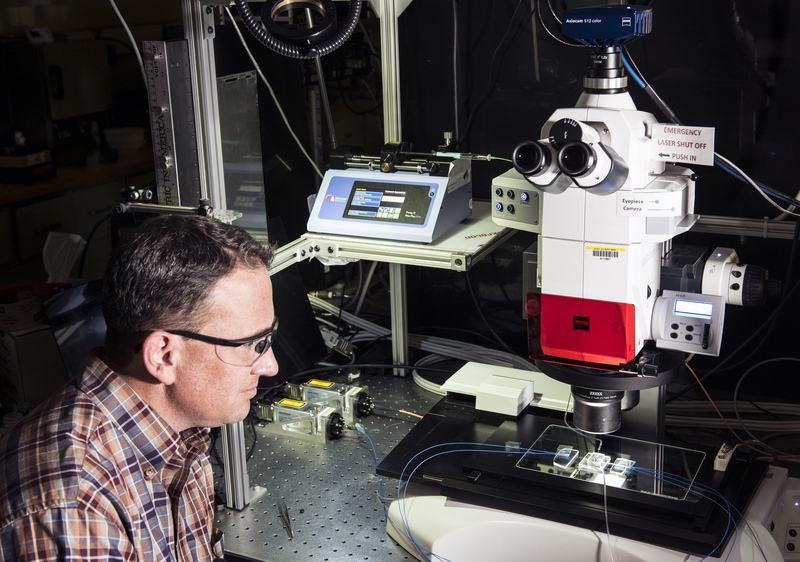 The invention is designed to fill an urgent need in the rapidly expanding field of microfluidics, in which precisely measuring tiny flow rates is critical. For example, some medical drug-delivery pumps dispense as little as tens of nL per minute into the bloodstream. For comparison, a single drop of water contains 50,000 nL. Clinical diagnostics, chemical research, cell sorting and counting, and continuous-flow micromanufacturing—essentially tiny factories that work nonstop to make small quantities of liquids—also increasingly require accurate measurements of similarly minuscule volumes. Greg Cooksey with apparatus used to observe microflow meter. But current state-of-the-art devices used to measure flow on that scale have one or more operational limitations. “Some require calibration, others use complex imaging systems and microscopes; some take data over many minutes, and therefore, can’t track dynamic changes, and some are not traceable to the International System of Units,” said inventor Greg Cooksey, a biomedical engineer in NIST’s Physical Measurement Laboratory. Flowing down a microchannel is a fluid filled with fluorescent molecules that emit green light when exposed to a specific wavelength of blue light. However, these molecules have been chemically modified to prevent fluorescence. At one point in the channel, an ultraviolet laser destroys the chemical modification of some of the molecules. At another point in the channel, a blue laser causes these bare molecules to fluoresce. Researchers determine flow rate by measuring the elapsed time between removing the chemical modification and fluorescence . After the activated molecule has traveled 250 micrometers—about the thickness of a playing card—downstream in the channel, it crosses the path of a blue laser (488 nm). The molecule absorbs the blue light and immediately emits green light (520 nm). That emission travels down a wave guide to an optical power meter that continuously measures changes in the emitted light’s intensity at a rate of 250,000 times per second. The emission signals are compared to the timing of the initial activating pulses to determine the elapsed interval. The faster the flow, the less time between activation and emission. The flow rate is deduced from careful measurements of the time between laser pulses and the channel dimensions, and those measurements are refined with calculations of flow pattern between activation and emission measurements. Therefore, the flow meter does not require calibration using an independent flow standard. In addition, it is more sensitive than most conventional technologies, and provides continuous real-time data with resolution on the order of 1 millisecond. The invention is also capable of serving as a flow cytometer—a device that counts, or otherwise measures, properties of biological cells in a fluid stream. There are many ways of engineering cells so that they contain fluorescent “biomarkers” of various kinds, which can be measured as they flow past the detectors in the NIST device. A provisional patent application, marking the start of the patent process, has been filed.